But with President Obama’s announcement last week that the United States was renewing diplomatic relations with Cuba, this is all about to change. The present trade embargos that have been impeding commercial relations will no doubt eventually follow. Before the ban, cruise lines had called primarily at Havana and Santiago de Cuba. The Florida-based Peninsular & Occidental Steamship Company (America’s “P&O”) ran a three-times-a-week service between Miami and Havana, leaving Miami every Monday, Wednesday and Friday with its 400-berth Florida. 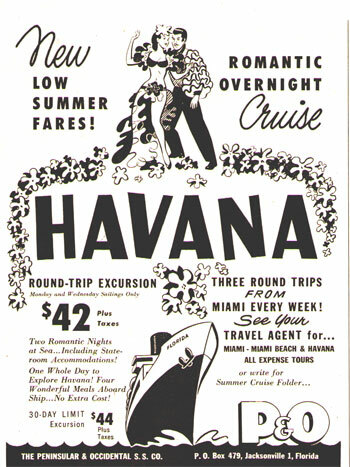 The Monday and Wednesday sailings accommodated round trip cruisers, who would get a full day in Havana. After the ban, the Florida went into the Miami-Nassau trade but the Peninsular & Occidental Steamship Company was gone within a few years, as was the West India Fruit & Steamship Company, which had been running the train ferries between West Palm Beach and Havana, and had counted among its passengers the Duke and Duchess of Windsor. The last passenger ship to leave Havana for the US, in September 1962, was the City of Havana, and for more than a half-century only European ships have called at Cuban ports. The City of Havana took 287 passengers, 237 of whom were Cubans with US residency certificates and the rest employees of the US State Department. Since then, cruise ships have not sailed from the US to Cuba. 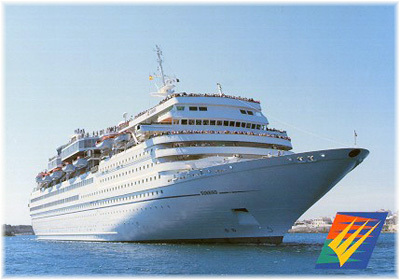 In recent years, it was Costa Cruises that began cruising from Havana with the 489-berth Costa Playa in 1995. But when Carnival Corporation bought a half share in Costa in 1997, the Cuban cruises had to be dropped. Carnival was based in the US and prohibited from trading with Cuba, and the Costa Playa was sold in 1998. Costa had gone further than just basing a ship in Havana, however. It had to dispose of a half interest in a joint venture it had started with the Cuban Government to operate cruise ship terminals in Havana, Santiago de Cuba and Isla de la Juventad, This new terminals company had been working with fourteen cruise lines, primarily from the UK, France and Germany. 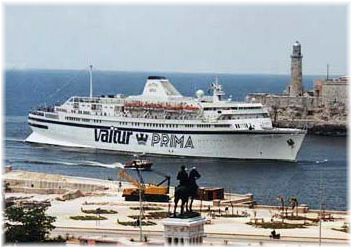 Another attempt to run cruises from Havana was made by Italian tourism group Valtur in 1999-2000, using the 540-berth Valtur Prima. Festival Cruises took her over in 2002 and renamed her Caribe. 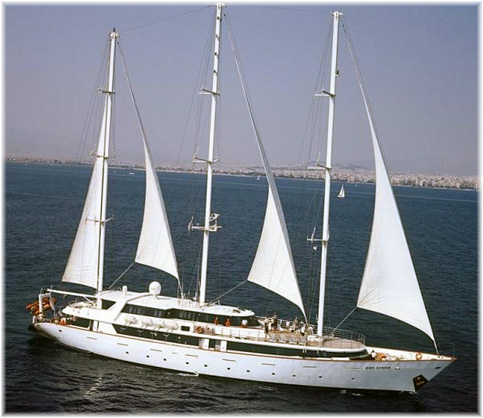 For a while, Festival also used its own 1,200-berth Mistral, built in 1999, on a seasonal basis from Havana. In 2004, however, Festival went under and the Caribe was withdrawn. She sails today as Portuscale’s Azores. 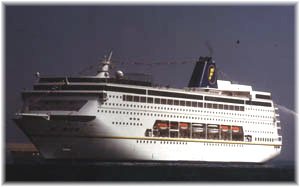 Also in 1999, Airtours, a UK company, began operating cruises that called on Cuba, with its 1,450-berth Sunbird, the largest cruise ship yet to call on Havana, setting a record when she arrived in Havana with 1,414 passengers on New Years Day 2003. But Airtours got out of the cruise business and the Sunbird now trades as the Celestyal Olympia for Louis Cruises. Spain’s Pullmantur Cruises began a series of cruises from Havana in late 2004, with its 752-berth Holiday Dream, but had to cancel the program in 2006 when it came under the control of US-based Royal Caribbean Cruises. As part of the deal, the Spanish line had to terminate the employment of 230 Cuban crewmembers working on its ships. As Cubans were not eligible to work for a US-controlled company they were let go. About half the Holiday Dream’s passengers had come from Spain, with the rest from Latin America. In 2005, Cuba had seen 102,440 cruise passengers arrive on 122 calls, but in 2007 this dropped by 90%, to just 11,000 passengers on 23 calls. In January 2011, another UK company, Thomson Cruises caused a stir when its 1,506-berth Thomson Dream became the largest ship yet to call on Havana. The former Costa Europa, she has been scheduled for a number of Havana cruises every winter since. Meanwhile, a Canadian organization called Cuba Cruise started up in 2013 and is now in its second season of weekly Round Cuba cruises from Havana, using the 966-berth Louis Cristal. The cruise includes calls on four of Cuba Cruises’ six regularly scheduled ports, Montego Bay, Cienfuegos, Isla de la Juventad and Havana. Departing from Montego Bay or Havana, the Louis Cristal season will run from December through March 2015. This year, a weekly charter flight also been added from Toronto to Havana. Other callers on Cuban ports have included Aida Cruises, Fred. Olsen Cruise Lines, Hapag-Lloyd Cruises, Peter Deilmann, Phoenix Reisen, Plantours, Saga, Star Clippers, Swan Hellenic, Thomson Cruises, Variety Cruises and Voyages of Discovery. The 1,708-berth Arosa Blu, now P&O Australia’s Pacific Jewel, appears to have been the largest cruise ship among these to have visited Havana, having called before P&O Princess was owned by Carnival Corp & plc. Indeed, Variety Cruises’ 49-berth Panorama is undertaking a special February cruise to commemorate visits by Winston Churchill to Cuba in 1895 and 1946. It was of course in Havana that Churchill acquired his taste for Cuban cigars. Just one American-based ship, Semester at Sea’s Explorer, has visited Cuba in recent years. Last month, she brought 624 US students and their 43 professors to Havana under a special educational license. Shipping routes between the US and Cuba actually began to reopen many years ago. In March 2001, Crowley Liner Services of Jacksonville, was granted a licence to carry eligible commodities to Cuba in weekly service from Port Everglades and Jacksonville to Havana, a city of 3.7 million people. One of these cargo ships actually carried a few passengers but US citizens are not allowed. When American main line cruise ships do return, this island country of 289 beaches stands to be very good cruising ground. If a small island like Cozumel can attract 2.5 million cruisers, then there is a huge scope for Cuba, with eleven potential cruise ports. And it won’t be just large ships. Small ships and sailing ships too will want to be able to take advantage of Cuba’s huge coastline. 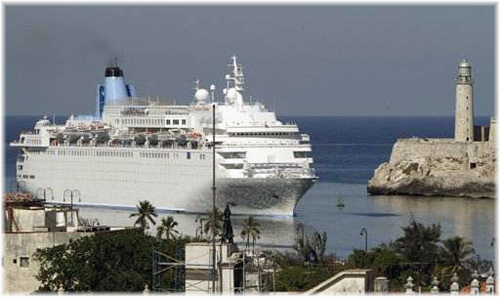 Cuba expects more than 200 cruise ship arrivals at various ports on the island this winter. The season kicked off last month and will run through April 2015. In 2013, the island welcomed about 2.85 million foreign tourists, with Canada being in the lead at over a million, followed by the United Kingdom and Germany. About 600,000 Americans also visited last year under present restrictions, well up from the 245,000 that visited in 2007. Eventually, shore-based infrastructure that will allow cruise and stay packages will follow new cruise port and terminal developments. There is berthing space for five or six cruise ships now in Havana, and while many European ships have been calling on Cuban ports, the real expansion will come with an eventual American return. According to Arnold Donald, ceo of Carnival Corp & plc, eleven ports around Cuba could handle ships belonging to the various Carnival fleets. However, there are size restrictions and Donald reports that Havana, for example, could not take big vessels. He adds that Havana has a relatively shallow draft and cannot be dredged because of a tunnel. In fact, Havana has a useable draft of 35 feet, which is adequate for most cruise ships. The Queen Mary 2, the world’s largest ocean liner, draws 32 ft 6 in, while Carnival’s largest ship, the 3,646-berth Carnival Dream draws 26 ft 2 in. Even the world’s largest cruise ship, the 5,408-berth Oasis of the Seas, draws only 30 feet, so Donald must have in mind other limitations, possibly to do with terminal facilities and maximum length of berthing. One person who will no doubt be watching closely is Frank del Rio, chairman of Prestige Cruise Holdings in charge of Oceania and Regent. Del Rio was born in Cuba and grew up there until almost the age of seven, when his parents fled the country after the failed Bay of Pigs invasion in 1961. The new cruise invasion will see millions of Americans coming in peace this time. As for del Rio’s intentions, he once stated that he had a desire to see one of Oceania’s new ships christened in the harbour in Havana. Maybe it will be a Regent ship instead. Last week, we reported that the Costa Celebration was due to arrive Freeport, Grand Bahama, last Thursday and sure enough she did, but at Freeport she was joined by another ship, which had also just arrived from Spain. The Balearia roro ferry S F Alhucemas, a full-hulled replacement for the Fort Lauderdale-Freeport catamaran arrived just a couple of days before the Costa Celebration on a mission of her own. Both vessels will be backed by the Government of the Bahamas, which has announced a $3 million advertising campaign in the Florida market to boost tourism to Grand Bahama Island. In a special press conference held at the Grand Lucayan Resort in Freeport, Bahamian Prime Minister Perry Christie last week announced that the Bahamas Celebration, which was put out of action by an accident on October 31, will be replaced with the Grand Celebration. Ironically, the ship will revert to her old Iberocruceros name, one that is appropriate to both Grand Bahama and Celebration Cruise Line. The Grand Celebration will offer two-night cruises and Bahamas cruise and stay packages of four to eight nights at Freeport resorts. The new vessel adds 50 percent more capacity to the Palm Beach cruise route, along with the ability to carry 280,000 year round passengers, with no fewer than 100,000 spending two or more nights in Grand Bahama in combination with the cruise. This should boost room nights sold from just under 50,000 in 2014 to more than 125,000 in 2015. Celebration Cruise Line has also committed to create job opportunities for no fewer than 300 Bahamians in the first phase of its operations and ultimately hopes that Bahamians can qualify for all the 632 jobs on board the Grand Celebration. The Grand Celebration will begin sailing between Palm Beach and Freeport in early February. Meanwhile, Balearia’s $100 million S F Alhucemas has been sent to Grand Bahama to replace the existing catamaran that has been running between Fort Lauderdale and Freeport since the end of 2011. Built in Spain four years ago, the 23-knot replacement vessel is one of the newer vessels in Balearia’s fleet. The replacement ship has a capacity for 1,000 passengers and 200 containers and will sail from Fort Lauderdale at 8 am and from Freeport at 7 pm daily. As a result of the new vessel, thirty direct jobs and 150 indirect jobs will be created in the Bahamas, Balearia Bahamas Express will also move its call centre sales from the US to Grand Bahama Island. And will begin offering cruise and stay packages in January 2015. Previous story Thinking of Flying a Drone in Antarctica?